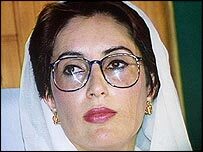 Benazir Bhutto was twice prime minister of the Islamic state of Pakistan. She was groomed for political office from the age of 9 by her father, Zulfikar Ali Bhutto. I was a very shy girl who led an insulated life. It was only when I came to Oxford and to Harvard before that, that suddenly I saw the power of people. I didn't know such a power existed. I saw people criticising their own president. You couldn't do that in Pakistan - you'd be thrown in prison. I saw the press take on the government. I was determined to go back home and to give to my people the freedoms and the choices- the individual dignity which I saw my college mates and everyone else in the West have. That early educational influence has profoundly affected my outlook on life. My father was the Prime Minister of Pakistan. My grandfather had been in politics too. However my own inclination was for a job other than politics. I wanted to be a diplomat, perhaps do some journalism - certainly not politics. But when my father was imprisoned, then assassinated, I had no other choice but to continue in the work that he had started because so many of his followers wanted me to do so. General Zia called the first democratic elections since 1977 when he learned that I was pregnant, thinking that a pregnant woman couldn't campaign. I could, I did, and I won - so that disproved that notion. The most exciting moment in my life was when I was sworn in as Prime Minister. I remember walking down the red carpet in the presidential palace, and I felt as though an invisible army of all those who had died fighting for freedom walked with me and it was a tremendous moment of vindication. I also felt a tremendous sense that Pakistan had showed the way for other Muslim countries - that a woman could be elected as chief executive. I found that a whole series of people opposed me simply on the grounds that I was a woman. The clerics took to the mosque saying that Pakistan had thrown itself outside the Muslim world by voting for a woman - that a woman had usurped a man's place in the Islamic society. I found that my opponents reduced themselves to verbal abuse rather than discuss issues- the very mere fact that I was a woman seemed to drive them into a frenzy. So that was the biggest challenge. I can deal with political differences, but how do you deal with it when someone says I don't like you because you're a woman and you've taken a man's place? I was brought up to believe that a woman can do anything that a man can. But there are certain things that only women can do such as carry a child and I found myself in a very strange position because each time I was pregnant my political opponents somehow thought I would be paralysed and would plot particularly against me at those points. Another time my political opponents had me teargassed at a time I was carrying my youngest child. It was a pretty harrowing experience. I found that the old-fashioned notion that a woman who's expecting a child has to be bedridden was absolutely wrong, a woman can do anything if she's lucky enough not to have morning sickness. I would like to be remembered for symbolising democracy in Pakistan and the Muslim world and for heralding a world of democracy in Pakistan. But above all I want to be remembered for what I did for women. My identity comes ultimately from being a woman and I felt that my life has to make a difference to the lives of other women so in terms of population control or in terms of exposing domestic violence or in terms of permitting women easy access to credit to start business of their own, I have always done my best to allow women to succeed. This article has been adapted from a special series on women and power from BBC World Service. Do you have any comments on this article? Send us your views using the form below. Everyone has clearly said that Benazir had failed as a Prime Minister not once but twice. Haven't men who have led the governments of different countries failed ever? I admire her strength and courage. She has shown that the impossible can be done. Regardless of political gains or losses, she has given hope to those who did not know how to dream of liberation. Would you mind clarifying exactly what it is that you did for women in Pakistan? I'm sorry, Ms Bhutto, but would you mind clarifying exactly what it is that you did for women in Pakistan during your stints as prime minister? I'm sure the women of Pakistan would like to be told as well. She talks of democracy, freedom of speech etc and yet practised very little (if any) of it when she was in power. She comes across as someone who has been wronged by the 'evil generals' in Pakistan - yet it was the people of Pakistan who were wronged during her two stints as Prime Minister. As rightly pointed out by other BBC viewers; like it or not, fact is that Pakistan and its people are better off with Musharaff. Ms. Bhutto is talking about how she has done her best to expose domestic violence, birth problems etc. However, in her two chances as prime minister, the situation of women in rural Pakistan (which is most of the the country's area), worsened and practices such as karo-kari (honor killing) continued unabated. I am a Mexican woman and I always support the Benazir Bhutto's actions. I think she is great woman. Benazir was given a couple of chances, and sure, she may have been better than Zia before he was assassinated but I feel that Musharraf is doing a great job of ruling Pakistan. He offers true freedom of speech, and Pakistan has progressed forward. She's using the excuse of religious clerics ruining her chances. The fact is, she became prime minister and blew it. No-one else is to blame for that. Pakistan isn't ready for democracy, and people such as Benazir Bhutto and Nawaz Sharif have proved it to us. It was very courageous of prime minister Bhutto to step forward and become the first female leader of Pakistan. Regardless of her policies, her ultimate legacy will be that the barrier is broken for all the other women. The point of this story was not about Benazir's successes or failures in her capacity as PM of Pakistan. It was intended to try to point out the struggles that a Muslim woman encounters when attempting to break free of the almost slave-like conditions that men impose on women in the name of Islam. Some of the previous posters to this article pointed out that Benazir's tenure as PM proves that Islam gives equal rights to men and women. As a non-Muslim Westerner I have to say that I have a hard time reconciling such an opinion against some of the tenets of Sharia law and things such as the "revenge killings" being perpetrated in countries like Jordan. The mere fact that Benazir became prime minister makes me proud of her. She defied all the so called Mullahs who claimed they know Islam and the role of women. I wonder how many of the so called Islamic scholars, who scorned and attacked Benazir personally, could have done what she tried to for Muslims in Pakistan - namely freedom and democracy? Please note, not only men are Muslims, Pakistani women are also Muslims who deserve the same rights as us men. If she is such a democrat, how come she got herself elected as the "lifetime" chairperson of her own political party. She is very good at preaching, but not nearly as good a practising. The fact remains that the people of Pakistan, both men and women, voted Benazir Bhutto into power. Even though the state of women in Pakistan is much better than in other countries, there are still some countries where women have little or no rights at all. Pakistan has never had much of a stable government, and it is easy in hindsight to say that she did little to contribute to Pakistan's government. It is easy to say that she had "a chance and blew it", sometimes it takes more than one chance and still today she tries to rise once again. In the US we have had many great and some not so great men presiding over our country. I hope that in my life time, the American public will vote a women as President. If an Islamic nation can do it, it's time for us to do so too. In fact Mr. Zulfikar Ali Bhutto was a world-class leader and is still considered as a true legend in Pakistani politics. Benazir had her chance to prove her leadership but she could not carry on the legacy of her father. Oh please save me the tears. Ms Bhutto had the chance to lead her country but instead plunged it deeper into despair and poverty so why should she be given a second chance? Give it a rest! What did she do for the women of Pakistan? Absolutely nothing! President Musharraf reserved one-third seats for women in the parliament, senate, provincial assemblies as well as in the local government councils. What did she do for the women of Pakistan? Absolutely nothing! I was in Pakistan when she was prime minister. She did not do anything to strengthen the democratic process in the country. She was elected because of her father, and had no political experience. Her opponents did not take her seriously not because she is a women or was pregnant but because she never had any serious issues to talk about. Instead of blaming others she should take a good hard look at her political mistakes. Ms. Bhutto's two terms in office had no positive impact on the lives of Pakistani women. In contrast Gen. Musharraf, has advanced female empowerment by having women in his cabinet, reserving 33% seats for them in local councils, and 20% seats in the National Assembly. Why couldn't Ms. Bhutto have taken similar steps? I don't think that the former prime minister qualifies to share the stories of her "struggle". The space taken up by this article could have been better used highlighting the experiences of an average woman in a Muslim society; a student or a working professional. Benazir becoming the Prime Minister of Pakistan proves that Islam gives equal rights to both men and women. Benazir becoming the Prime Minister of Pakistan proves that Islam gives equal rights to both men and women. Mr. Bhutto, her father, was a great leader who wanted democracy to flourish in Pakistan and Benazir's will to carry on his mission will keep him alive. She speaks now as if she was championing the cause of Muslim women but Pakistan is definitely a lot better off today under President Musharraf in terms of freedom of speech and progress. How can a woman be voted head of state in a country where a majority of women cannot go out, work, marry, vote etc without the permission of their men? Pakistan was and still is largely a feudal society where block voting occurs by decisions largely dictated by the men and particularly the elders of a tribe. Pakistan or any Third World country does not need the shambles of democracy as in the US and UK, which are elected dictatorships on behalf of global companies. Islam is a much abused by Muslims, especially so called leaders and extremely misunderstood by the West. Let the West have true democracy itself, especially where power matters (UN Security Council) before it starts dictating to the rest of the world that they must have democracy. Reading through this article, the world will get an impression that Benazir is the sole voice of true Pakistanis. Well that is not the case. We are better off now under Musharraf than we were when she was in power. What did she do in Pakistan in two terms of premiership? Did she practice any of the democratic norms she is now talking about? How come she is party chairperson without being elected by the members? Benazir was given the chance not once, but twice, to change the life of millions and destiny of a nation. She failed.. I have relatives and indeed my wife is from Pakistan. I am a British Asian (born and bred in the UK). Frankly, she was given a chance and she blew it. The point is not what your country can do for you but what you can do for your country!